The Arab Spring winds are not to calm down any time soon in Algeria and by extension in the Polisario camps in Tindouf. The leaders of the Sahara independence-seeking movement are increasingly worried as the date of the elections in Algeria, their host country, is getting nearer. But what is most worrying for the Polisario leaders is that more voices are being raised within the host country to denounce their protracted presence on Algerian soil as well as the financial burden they have represented for Algeria for more than three decades. Just last Sunday, the secretary general of the Algerian Islamist movement, “El Islah,” Hamlaoui Akouchi, called during a press conference held at his party’s headquarters in Belouizdad near Algiers, for the reopening of borders between Algeria and Morocco. “We are two brotherly, neighboring peoples. We need to transcend our differences and move forward … This reopening of borders should not be linked to the Western Sahara conflict or to smuggling operations. This exists everywhere in the world,” he argued. The conflict with Morocco is to be imputed to Algeria, Hamlaoui Akouchi underlined, explaining that “the arguments put forth by Algeria are not rational and the conflict has nothing to do with the Western Sahara issue.” “If Algeria had supported the Libyan revolution, the Algerians would not have been attacked by their neighbors” (Morocco and Tunisia), he also said. 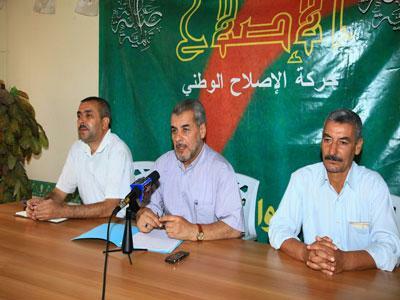 Another Islamist movement, mustering many associations of Algerian expatriates, recently called the Algerian people to expel from the country the leaders of the Polisario and to close down their offices in Tindouf, to end wasting the Algerian taxpayer money in defending separatist theses. The movement denounced the loss of billions of Algerian petrodollars that were used over the past 36 years to arm the Polisario militia, to pay the travels of its leaders abroad and to finance lobbying agencies and media and propaganda campaigns to help the Sahrawi Republic gain international recognition and legitimacy, under the cover of championing peoples’ right to self-determination.